ACM Transaction on Graphics, 37(6), Article 187, 2018. Proceedings of SIGGRAPH Asia 2018. 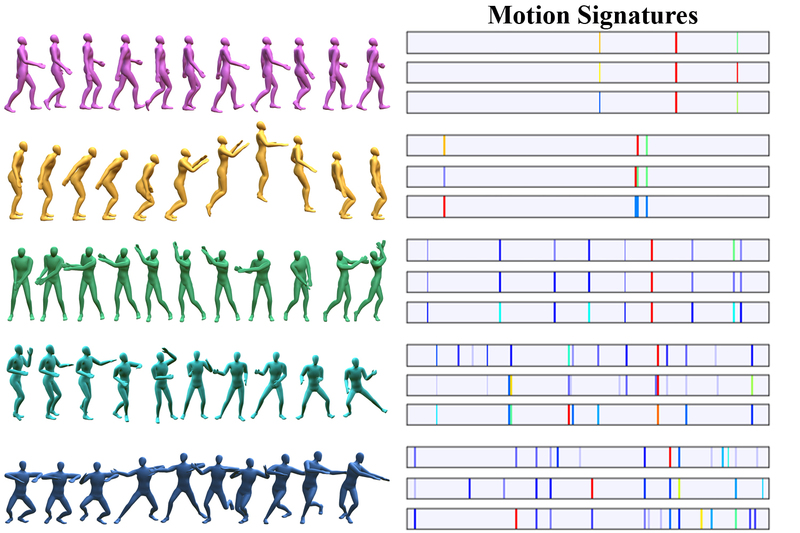 We introduce deep motion signatures, which are time-scale and temporal-order invariant, offering a succinct and descriptive representation of motion sequences. We divide motion sequences to short-term movements, and then characterize them based on the distribution of those movements. Motion signatures allow segmenting, retrieving, and synthesizing contextually similar motions. Computer Graphics Forum, 37(2): 297-309, 2018. 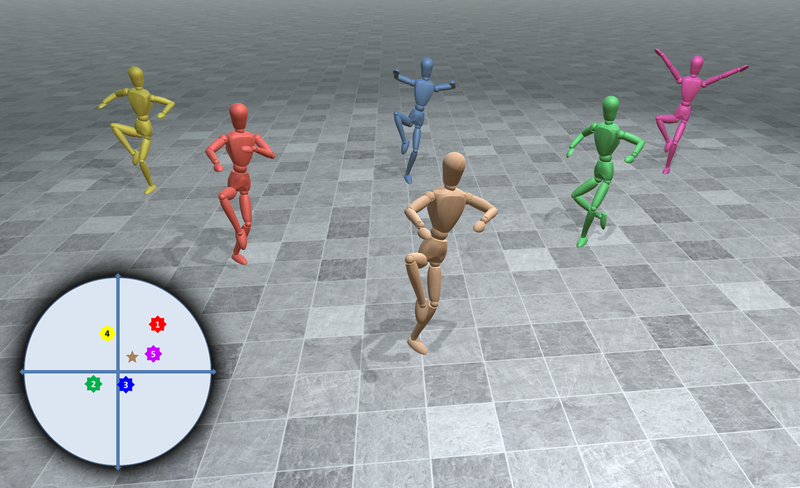 Our method automatically analyzes mocap sequences of closely interacting performers based on self-similarity. We define motion-words consisting of short-sequences of joints transformations, and use a time-scale invariant similarity measure that is outlier-tolerant to find the KNN. This allows detecting abnormalities and suggesting corrections. Computer Graphics Forum, 37(6): 35-58, 2018. Presented at Eurographics 2018 (STAR paper). In this survey, we present a comprehensive review of the IK problem and the solutions developed over the years from the computer graphics point of view. The most popular IK methods are discussed with regard to their performance, computational cost and the smoothness of their resulting postures, while we suggest which IK family of solvers is best suited for particular problems. Finally, we indicate the limitations of the current IK methodologies and propose future research directions. The Visual Computer, 34(12), 1725-1737, 2018. 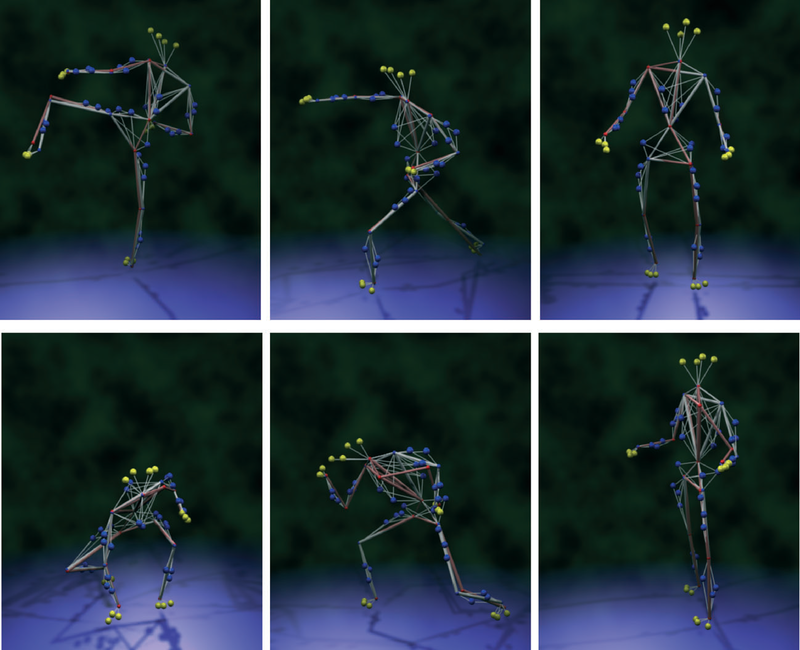 This work presents a motion analysis and synthesis framework, based on Laban Movement Analysis, that respects stylistic variations and thus is suitable for dance motion synthesis. Implemented in the context of Motion Graphs, it is used to eliminate potentially problematic transitions and synthesize style-coherent animation, without requiring prior labeling of the data. ACM SIGGRAPH/ Eurographics Symposium on Computer Animation, SCA'17. Eurographics Association, July, 2017. 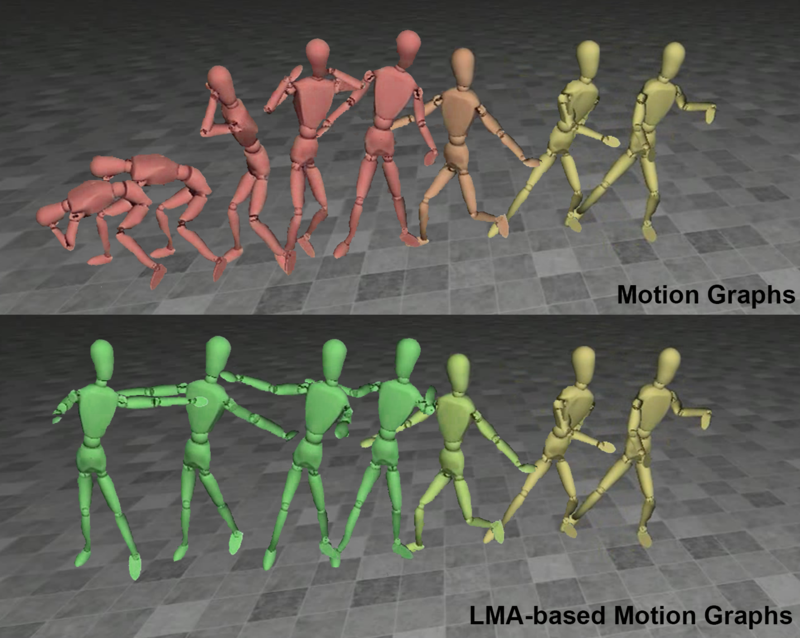 We present a motion stylization technique suitable for highly expressive mocap data, such as contemporary dances. The method varies the emotion expressed in a motion by modifying its underlying geometric features. 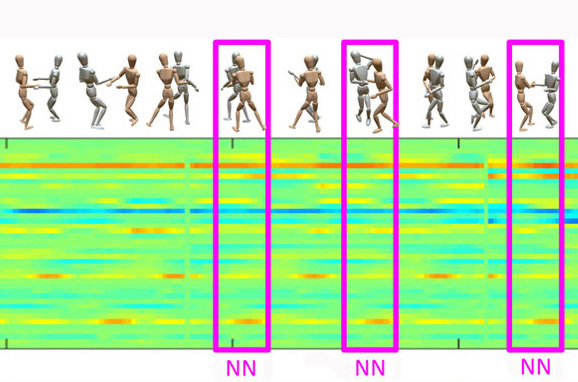 Even non-expert users can stylize dance motions by supplying an emotion modification as the single parameter of our algorithm. The Visual Computer, 34(2): 213-228, 2018. 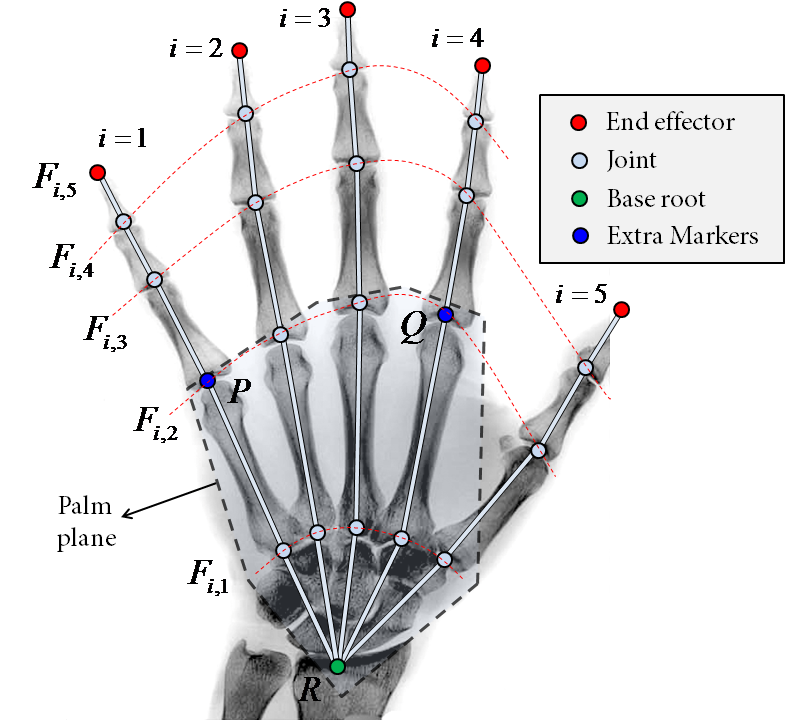 We present a simple and efficient methodology for tracking and reconstructing 3D hand poses. Using an optical motion capture system, where markers are positioned at strategic points, we manage to acquire the movement of the hand and establish its orientation using a minimum number of markers. An Inverse Kinematics solver was then employed to control the postures of the hand, subject to physiological constraints that restrict the allowed movements to a feasible and natural set. Comp. Animation & Virtual Worlds, 27(3-4): 311-320, 2016. We propose a system for continuous emotional behavior recognition expressed by people during communication based on their gesture and their whole body dynamical motion. The features used to classify the motion are inspired by the Laban Movement Analysis. Using a trained neural network and annotated data, our system is able to describe the motion behavior as trajectories on the Russell Circumplex Model diagram during theater performances over time. Comp. Animation & Virtual Worlds, 27(1): 35-57, 2016. 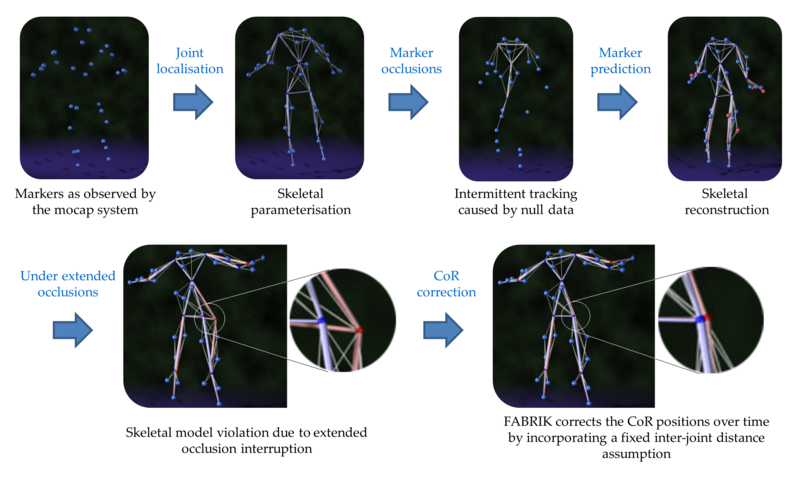 This paper addresses the problem of manipulating articulated figures in an interactive and intuitive fashion for the design and control of their posture using the FABRIK algorithm; the algorithm has been extended to support a variation of different joints and has been evaluated on a humanoid model. ACM Journal on Computing and Cultural Heritage, 8(4): 1-19, 2015. Best paper award at EG GCH 2014. We present a framework based on the principles of Laban Movement Analysis (LMA) that aims to identify style qualities in dance motions, and can be subsequently used for motion comparison and evaluation. We have designed and implemented a prototype virtual reality simulator for teaching folk dances in which users can preview dance segments performed by a 3D avatar and repeat them. 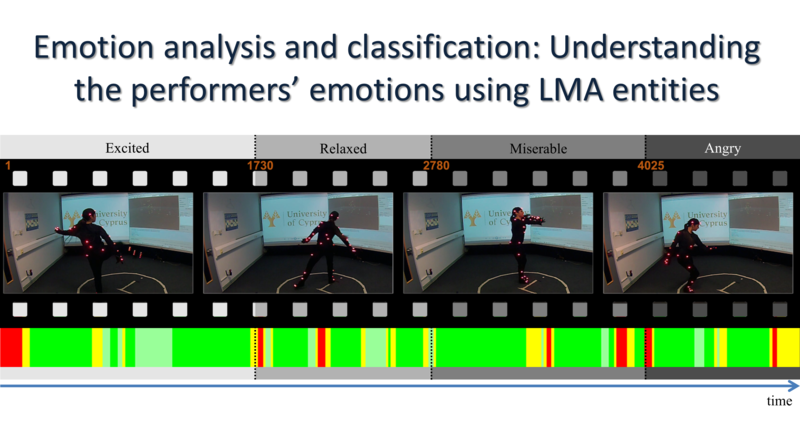 The user’s movements are captured and compared to the folk dance template motions; then, intuitive feedback is provided to the user based on the LMA components. Computer Graphics Forum, 34(6): 262–276, 2015. 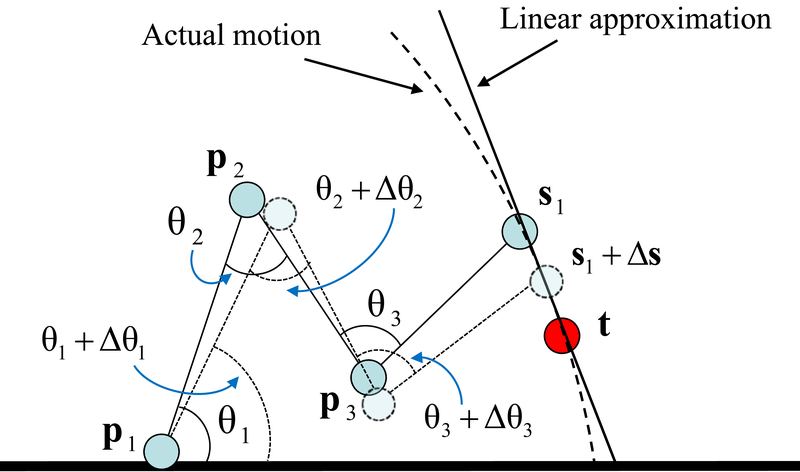 We proposed a variety of features that encode characteristics of motion, in terms of Laban Movement Analysis, for motion classification and indexing purposes. Our framework can be used to extract both the body and stylistic characteristics, taking into consideration not only the geometry of the pose but also the qualitative characteristics of the motion. This work provides some insights on how people express emotional states using their body, while the proposed features can be used as alternative or complement to the standard similarity, motion classification and synthesising methods. Cyprus Computer Society journal, Issue 25, pages 42-49, 2014. We aim to preserve the Cypriot folk dance heritage, creating a state-of-the-art publicly accessible digital archive of folk dances. Our dance library, apart from the rare video materials that are commonly used to document dance performances, utilises three dimensional motion capture technologies to record and archive high quality motion data of expert dancers. Guide to Geometric Algebra in Practice, L. Dorst and J. Lasenby (Eds), pages 47-62, Springer Verlag, 2011. An iterative Inverse Kinematics solver is implemented using Conformal Geometric Algebra. We use a human hand as an example of implementation where a constrained version of the IK solver is employed for pose tracking. 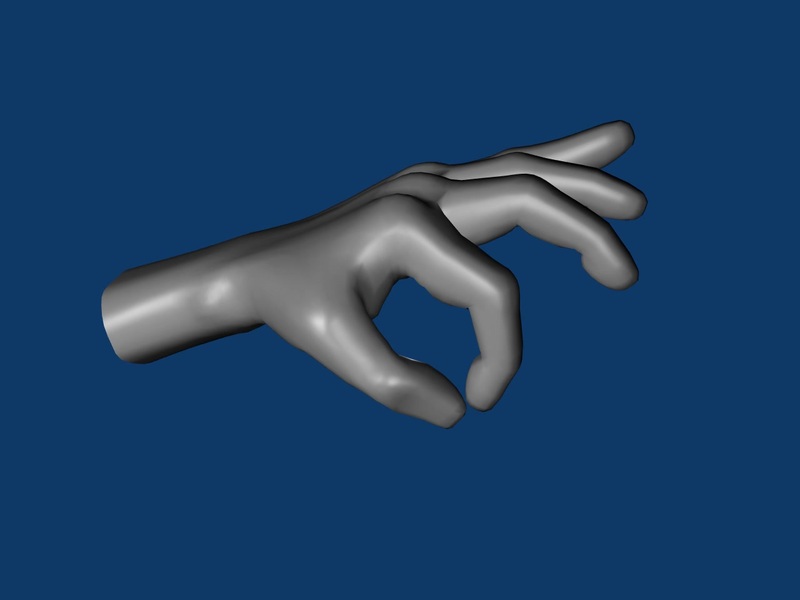 The hand is modelled using CGA, taking advantage of CGA’s compact and geometrically intuitive framework, that basic entities in CGA, such as spheres, lines, planes and circles, are simply represented by algebraic objects. 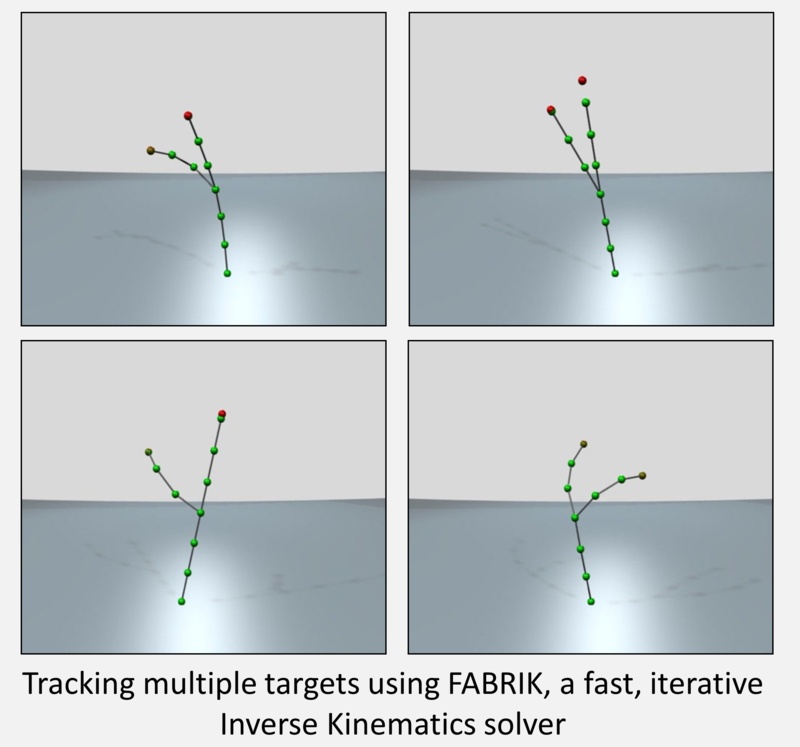 A novel heuristic method, called Forward And Backward Reaching Inverse Kinematics (FABRIK), is described that avoids the use of rotational angles or matrices, and instead finds each joint position via locating a point on a line. 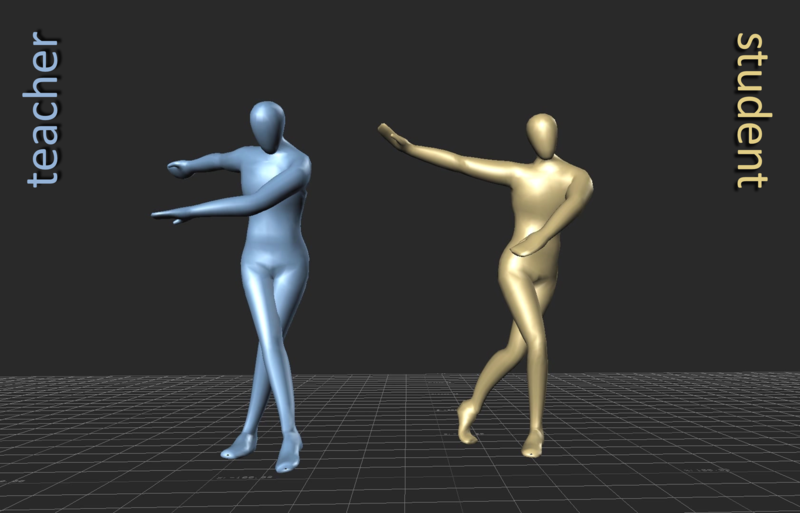 Thus, it converges in few iterations, has low computational cost and produces visually realistic poses. Constraints can easily be incorporated within FABRIK and multiple chains with multiple end effectors are also supported. In Proceedings of the 6th Conference on Applied Geometric Algebra in Computer Science and Engineering (AGACSE’15), Barcelona, Spain, July 2015. In Proceedings of the 5th International Conference on Cultural Heritage (EuroMed’14), LNCS, volume 8740, pages 207-216, Limassol, Cyprus, November 3 – 8, 2014. In Proceedings of the 9th International Conference on Computer Graphics Theory and Applications (GRAPP’14), pages 277-287, Portugal, January 05-08, 2014. In SIGGRAPH Asia Technical Briefs (SA’13), ACM, New York, USA, 21:1-21:4, 2013. In Proceedings of ACM Motion in Games (MIG’13), Ireland, November 7-9, 2013. In Proceedings of the 4th International Conference on Progress in Cultural Heritage Preservation (EuroMed’12), LNCS, Volume 7616, pages 404-413, 2012. In IEEE Proceedings of the 4th International Symposium on Communications, Control and Signal Processing (ISCCSP’10), Limassol, Cyprus, May 3-5, 2010. In Proceeding of the International Conference on Image Processing, Computer Vision, and Pattern Recognition, IPCV'07, pages 53-59, Las Vegas, USA, June 25-28, 2007. In Proceedings of the Hellenic Artificial Intelligence Conference SETN-06, LNCS, Volume 3955, pages 502-507, Heraklion, Crete, Greece, May 18-20, 2006. A dissertation submitted to the University of Cambridge for the Degree of Doctor of Philosophy, Cambridge, October 2010. Supervisor: Dr Joan Lasenby, Examiners: Prof William J. Fitzgerald & Prof Adrian Hilton. Annual journal of the Department of Informatics & Telecommunications, Best dissertations of the year, pages 127-136, Athens, Greece, 2006. Technical Report (UCY-CS-TR-13-2), University of Cyprus, August 2013. Technical Report (CUEDF-INFENG, TR-619), University of Cambridge, January 2009.